Most companies have KPIs, but what use are they if the teams and individuals they measure and affect can’t see them and take action? 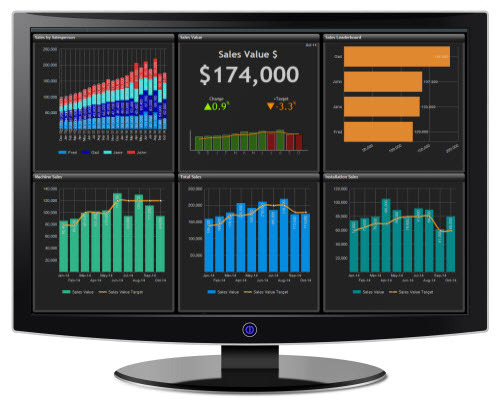 Displaying a dashboard on a big screen might give you a much needed overview. It will also show a live presentation containing a selection of important KPIs to serve as motivation and show the detail you need to increase performance in your team. You want your sales team to have visibility of their performance against target. Your service desk team needs to have constant visibility of outstanding support issues. In a warehouse, you can show your team an up to date view of their workload - The possibilities are numerous. Whether you want to display a whole dashboard or a slide show of individual KPIs, with Target Dashboard you can have them live on any screen, anywhere. All you need is a web browser and an internet connection. If you want to find out more, just get in touch.